A two-mile "superpipe" being installed to improve Blackpool's bathing waters has been broken by Storm Brian. United Utilities confirmed that a 250-metre section of the pipe had been "bent at a 90-degree angle" after gale-force winds hit the UK coast on Monday. The water company said a new section has been ordered from a factory in Norway. The 20,000-tonne pipe is part of the firm's £200m plan to improve water quality in the Lancashire resort. The pipe was first damaged by ex-Hurricane Ophelia last week that hit Ireland and the west coast. A United Utilities spokesman said the pipe "almost snapped" as a result of the storm damage. "We wanted to send out boats to repair the damage but we were advised it was not safe enough." Adding: "It's been bent at a 90-degree angle and will need replacing. "We have ordered a new section but the Norway factory is the only place in the world that makes a pipe this big." 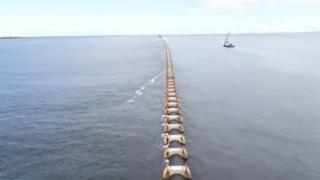 The massive outfall pipe arrived at Anchorsholme near Blackpool on 9 August after being towed in six sections from Norway to Lough Foyle in Northern Ireland. It was then assembled into one long pipe ready to be installed in a huge trench under the sea. It will be used during periods of heavy rain to pump storm water away from the sewer network. The aim is to prevent flooding and ensure the water mixes far out into the sea helping to protect bathing waters. Work on the pipe is expected to finish in 2019.